Enjoy a cup of coffee, latte art, a newspaper read and the modern ambience . Broadway Pastry Coffee Shop vision is to bring South Boston a refined, yet modern, pastry & coffee shop. We are pleased to be the first coffee shop in South Boston to serve “Guglielmo Coffee” exclusively. Guglielmo carefully chooses the different types of coffee imported, relying on qualified suppliers that can guarantee a consistent quality of the product. Green coffee, before being placed in the production cycle, is tested by specialists who carefully evaluate the organoleptic quality to ensure the aroma and taste of the blends produced. 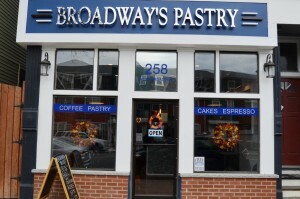 Broadway Pastry Coffee Shop is committed to providing the premier coffee experience in South Boston by serving only the finest coffees, teas, and freshly baked pastries and sandwiches.